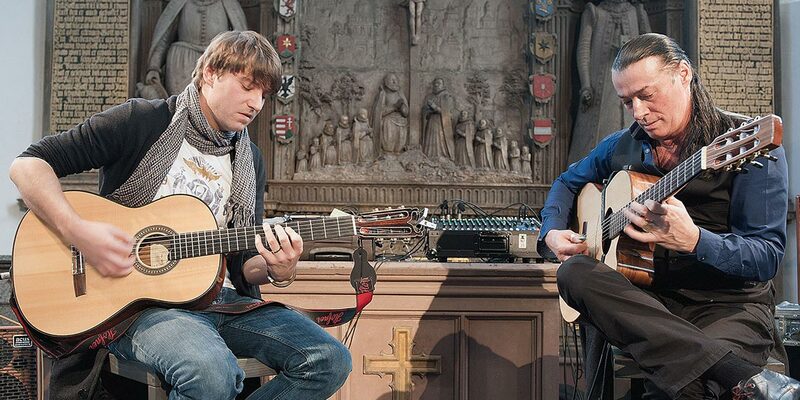 Lulo Reinhardt & Daniel Stelter are famed solo guitarists throughout Europe who have gone on to even greater success as a duo. Whether playing a scorching lead or a cool rhythm, they bring new life to classics from Lulo’s great uncle, Django Reinhardt, to Duke Ellington. Each is a riveting soloist with a wide variety of styles and influences that extend from Argentina to Cuba and back to their German Gypsy roots. Django Reinhardt left behind an indelible musical legacy, introducing and defining a passionate style of Gypsy Jazz guitar that was astonishing in the 1930’s and is still revered and emulated today. Born to a Gypsy family in Belgium, Django’s playing inspired his extended family in Germany and France, and successive generations of Reinhardts have reinforced his powerful musical vision and added their own ideas. Lulo Reinhardt, Django’s grand nephew, is a third generation master from Germany. He has retained the incredible Reinhardt soul, speed and dexterity and updated the repertoire. Daniel’s Stelter’s unique guitar style has made him a landmark musician in Germany’s Jazz scene. His sound encompasses jazz, pop and classical music. Since 2003 Stelter has been enhancing his own signature sound. Today he is a guitarist in demand, well-known on German jazz stages.